Bathrooms traditionally are where you’ll find the highest moisture content of the house. It’s important to carefully consider the material you choose for a bathroom. If you are dealing with a half bath, where there is no tub or shower you have more options than in a full service bathroom. Where there is water there is also a risk for hidden damage beneath surface layers where wood can rot and mold and mildew like to grow. We only offer the most environmentally friendly and non-toxic flooring materials here at Natürlich. We do not provide tile, stone and concrete, which can be good for sealing out water, but tend to be cold and uncomfortable underfoot and may be slick, therefore presenting slipping hazards. Also, grouting can be hard to keep clean. As with kitchens, here at Natürlich natural linoleum and cork are our top choices for bathrooms. There are pros and cons to all flooring options for a bathroom; besides water damage, it’s important to consider safety and comfort in a room where you’re going to spend a lot of time on your feet, often without shoes. Carpeting can feel good underfoot but is harder to keep clean and free of mold than hard surfaces. For a floor with radiant heat, a floating floor will work well. You can float cork, engineered wood or click Marmoleum. Cork flooring is a great option for bathrooms as long as it’s covered with a good water-resistant sealer. Aside from the environmental benefits of cork, it has a wonderful natural look and feel. In a bathroom cork flooring offers some very useful unique features such as its insulating properties - both for warmth and sound, it’s slip-resistant (even when wet! ), and it’s hypoallergenic. Regular sweeping and damp mopping help protect the finish from dirt and grit. While cork floors are not waterproof, they are water resistant. Our selection of prefinished cork is sealed with many layers of durable finish. 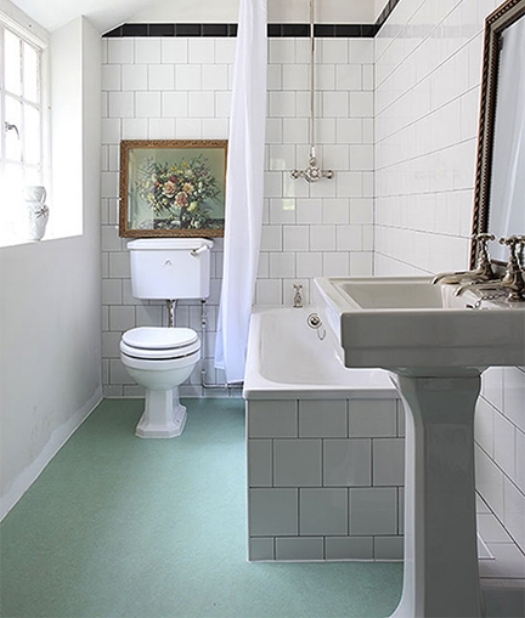 For bathrooms, it’s hard to beat sheet linoleum. As a flooring material that was discovered almost a hundred years ago, it continues to be a proven winner for high traffic, high use areas of the home. Nowadays it comes in many styles and colors that range from fun, wild or retro - to natural and neutral. At Natürlich we offer Marmoleum brand linoleum in sheet, tiles and click tiles. The sheet material comes in 79” width rolls and can be cut to size with a minimum of exposed seams, so there’s less chance for water and moisture to get underneath. Linoleum is anti-microbial, durable, non-slippery and water-resistant. It’s also more barefoot friendly than tile and easy to clean with no grout to scrub. And of course, since linoleum is made from natural materials, it’s much more friendly to the environment than vinyl and will look great and hold up for many, many years when properly cared for. These days wood floors – both solid wood and engineered – as well as bamboo are popular to use in every room of the house - even the bathroom. They have a great natural appeal and will offer a continuous look if you have used the material elsewhere in the home. As long as you are careful to choose a good finish, keep the humidity in the room to a minimum, and dry up any spills quickly, wood flooring can be warm and inviting in a bath. Refer to the tips above to help protect the flooring from moisture and standing water.